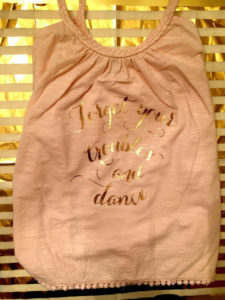 If you are planning to encourage your dancer friend, you might as well give one of the below great gifts for dancers. You might have come across the popular saying that reads ‘dance is a delicate balance between perfection and beauty’. 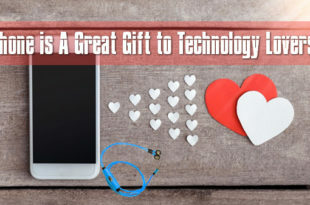 If you are happy that one of your family members or friends is into this profession, regardless of whether he/she is a beginner, here are some gift ideas that will be loved by the dancer. When you get the best gifts for dancers, try to make sure that the gift will be of some help to his/her profession. 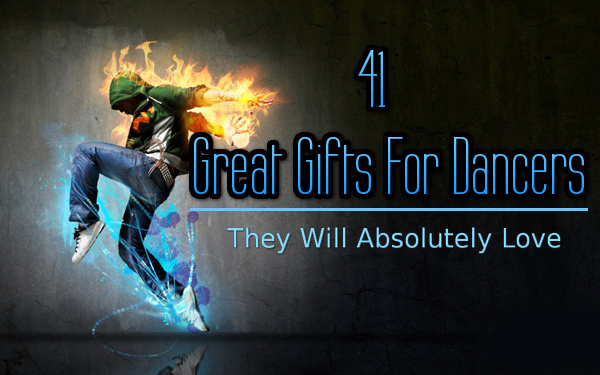 Now, it is time for us to explore 41 gifts for dancers as you are looking for what to gift dancers. Similar to that of sweaters, leg warmers are to be worn on the legs to ensure warmth. You can opt for this unisex adult leg warmer, which is pure polyester, which comes in the size of 10” high and 10” wide. Some dancers wear leg warmers on their arms to keep the arms warmth during summer months. But, arm warmers are built in the right fashion to suit arms. This arm warmer is made out of dense fabric with modern texture to provide the utmost warmth. As it is of contour shape, it will fit rightly into the curves of hands and arms. In general, a luxurious soak in a foot spa or foot bath will help with relieving pain and aches. This padded foot rest can be easily fitted to the foot sink and can be removed when not in use. He/she can sink the foot in warm water after a day of hectic practice sessions. In general, anyone with a sore foot is recommended to soak foot in Epsom salt filled water or in a tub of water with a few drops of essential oil. 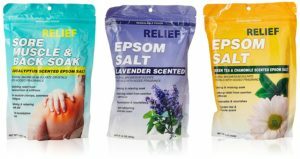 When Epsom salt is mixed with relaxing essential scents, it can be one among the great gifts for dancers, right? You can choose this set of Epsom salt with lavender, eucalyptus, green tea & chamomile scents. This will relieve him/her of the boring scented soaks every day. 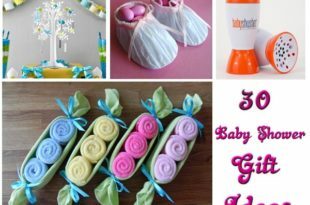 You can also opt for foot towel, pumice stone or foot grooming kits as gifts. Irrespective of whether she is in her practice sessions or in her performance a fitting earring can surely add beauty to her performance. 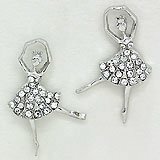 You can consider presenting her with this dancing ballerina crystal stud post earrings with rhinestones to really enthrall her. If your friend is practicing different styles of dance, she will have to carry different things for each of her classes. 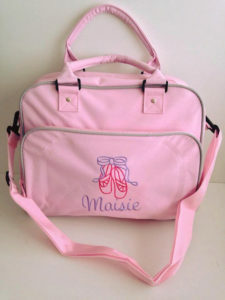 This personalized dance bag can be the excellent gift for her to hold as many things as she needs. This bag can be carried not just on the shoulder, but also in hand. The internal mesh pocket, detachable adjustable shoulder strap, zippered front and main compartment with her name printed can surely be a worthy if you are confused what to gift dancers. Do you wish to share your friend that you too love dance? 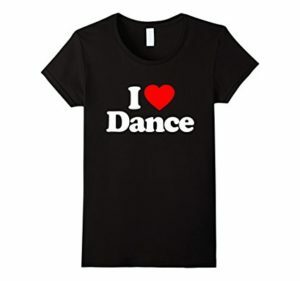 You can choose this ‘I love dance’ printed funny T-Shirt. She can wear it showcasing her interest towards dancing. This is a pure cotton shirt that is imported. It is a lightweight, classic fit t-shirt with bottom hem and double-needle sleeve. Not just for her, this t-shirt can be gifted for him as well. Nowadays, it is hard to find people without a smartphone. You know that your dancer friend also has one. You can present her with this dancer mobile phone sleeve. 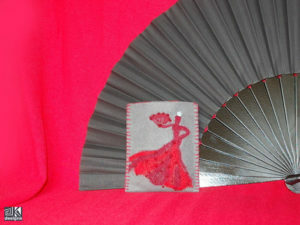 It is hand-stitched with felt material. To provide better protection to the phone, this case has two layers and is closed with a press stud. 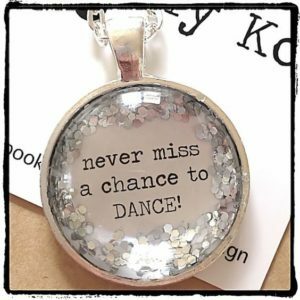 If you wish to motivate your friend, who has just begun her dancing classes, you can present her with this pendant with glittering silver sequins inside. The face of the pendant reads ‘never miss a chance to dance’. This will bring her a motivation and she will be relieved of the shyness when the time arrives to perform in front of others. 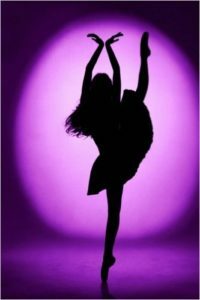 Do you wish to define dance is all about to a newbie dancer in your family? 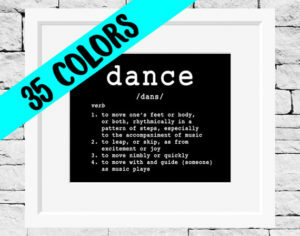 You can present him/her with this wall hanging that rightly defines what a dance is all about. This frame is printed on good quality archival paper. Also, the printed content is finished with luster coating to last longer. Dancers generally need to dress themselves up before a stage performance. 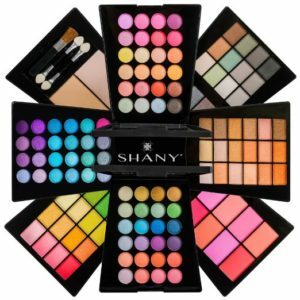 So, you can consider presenting your friend with this makeup set from Shany Cosmetics. This set contains neutral and bright eye shadow shades and also matte face powders and blushes to give your friend an excellent look to boost her confidence level for the performance. Why not consider presenting the dancer with a dancing girl figurine? 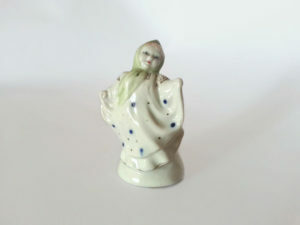 This figurine of dancing small Russian girl can be the best gift if she loves vintage collections as it was made in Russia in the 1960s. 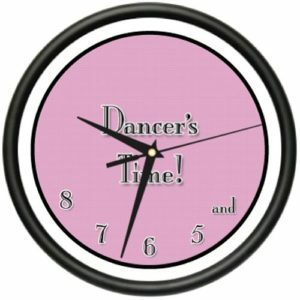 If you wish to denote the importance of time to your friend during her practice sessions, you can present this Dancer’s Time wall clock to him/her. It is a huge 10” wall clock with precision quartz movement. It can be the best gift not just for a practicing dancer, but also for an experienced dancer. 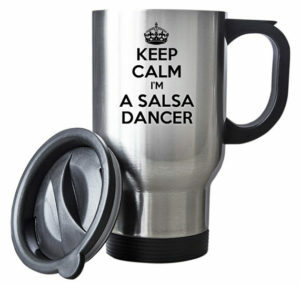 If one of your family members is practicing to become a professional salsa dancer, you can present this travel mug with the words ‘keep calm I’m a salsa dancer’ printed on it. This travel mug is 14oz size and it is made out of insulated stainless steel. The height is 150mm and the diameter is 85 mm. 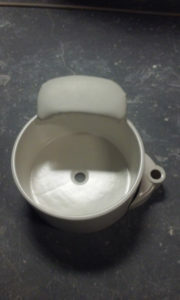 To stop leakage, the lid has a rubber rim and also there is a swivel mechanism to close and open the drinking holes. 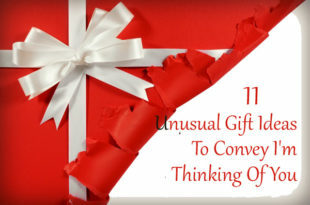 This gift can be the excellent presentation for his/her practice sessions, regardless of whether he/she will have to visit places for practice sessions. Any individual, who has plans to become a professional dancer, should read this book at least once in his/her lifetime. 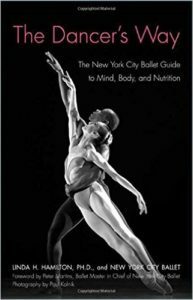 This book can act as the guide for dancers to follow a proven wellness program, such that they can reach their potential without compromising their health. To become a professional dancer, your friend will have to engage in a lot of practice sessions, which will include practicing body moves and hip moves. This is where this collapsible hula hoop can be the excellent and useful gift. 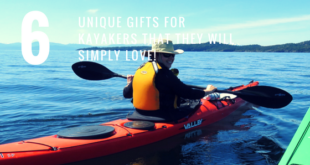 As it is collapsible, it can be carried with wherever he/she goes for practice sessions. 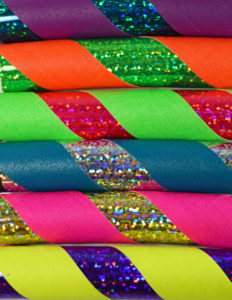 There is a grip tape to keep the hoop on the body, while the durable glitter tape adds shine to the dance hula hoop. If you motivate your girl or boy to become a dancer, you should insist that he/she is a dancer in each and every item that he/she uses. 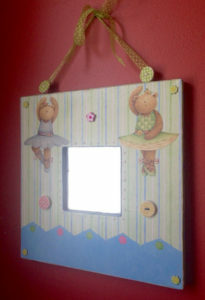 You can present the boy or girl with young dancer bag tag that can be personalized with his/her name and color. If your friend is highly worried that she cannot succeed in a dance competition and if you are afraid whether she will drop out her dancing practice sessions, you can present her this pendant. 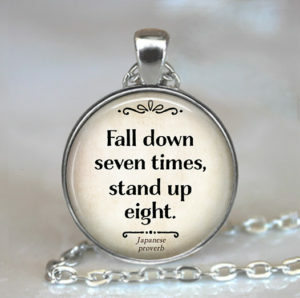 This is a motivational pendant that reads ‘fall down seven times, stand up eight’. It is a motivation for her to continue her practice sessions to win in the forthcoming competitions. So, you are interested that your daughter should see dance wherever she turns and whichever item she uses, right? 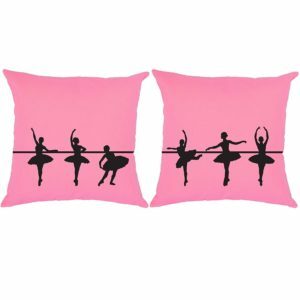 So, you can opt for this set of 2 ballet dancer pillows. These are barre throw pillows of 16×16 size and you can opt for the favorite color of your daughter as there are 8 different color options to choose from. 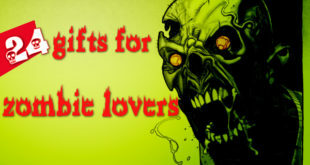 This can be the most apt gift for your dancing teenager. 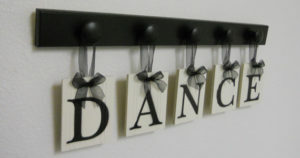 The letters for the word dance are painted on fiberboard tiles that measure 3×4 and these boards are hung on an organza ribbon bow. It can also be a wall decoration and can also act as a wall hanging for hanging things like a hat, coat, etc. If you know that your dancer friend has a transparent locket, you can present her with this set of floating dancer charm set from JAM outlet. The items you will find in this set of 8 charms are ballet shoes, love to dance symbol, a Silver Star, pink enamel star, silver dancer, pink tutu, a 4mm crystal and the word best. She can use any of these items on her transparent locket. Let us consider that one of your friends has the aim of becoming a dancer, but some troubles in her family prevent her from participating in practice sessions. You can calm her by presenting this costume that comes with the prints ‘forget your troubles and dance’. It is available in four different color options and sizes to choose from. If you have enrolled your little girl in dancing classes, she will need a bag to carry her dancing stuff like tights, leotard, and flats. 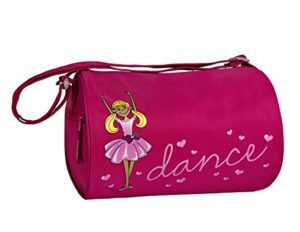 For her, this cute small pink duffel bag with the image of an adorable ballerina dancer can be the most useful and the best gift. It comes with zipper closure with an exterior zippered pocket. The pink strap is adjustable and it is suitable for girls aged between three and eight years. 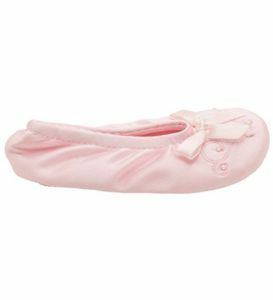 If your girl has plans to join Ballerina dancing classes, you can present her with this Isotoner Satin Pearl Ballerina Girls Slippers. It is made out of synthetic and leather. The foam cushion and the stretch satin upper suede leather will be soft on the little foot of your little girl. Not just for her practice sessions, she can wear this luxurious pair during her on-stage performances and also for weddings and other parties that she visits. 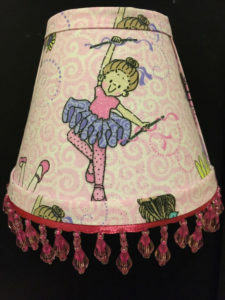 Let the dream of your little girl of being a Ballerina night light come true with this night light which will instill good thoughts and goals in her minds when she sleeps. This nightlight comes with pink trim, thereby giving a girly look. The lamp comes pre-fitted with a bulb. Ballerina figurine, wherever she turns will surely keep your daughter focused towards dancing. 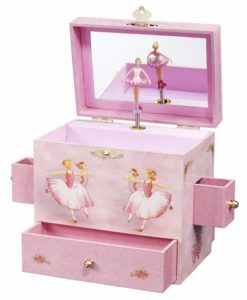 This treasure music box with dancing ballerina image will be the best gift for motivating her. 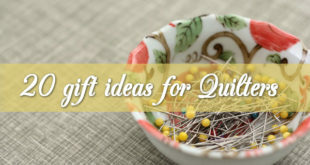 It plays ‘swan lake’ music and it can be the best for storing tiny treasures like earrings, pendants, etc. There is a large drawer at the bottom and two tiny drawers on both sides of the box for holding jewelry and other treasures. For a dancer, lip balm will be highly helpful as she will have to pamper herself before the stage performances. Also, these balms will give a shiny look to the lips. This set has 5 different lip balm flavors and also you can customize the label with her namef or the name of her dance team or any other motivating quotes for her to cheer her up before the big day of performance. If your son is keen towards a career in dancing, you can present this vinyl decal sticker with ballerina dancers that can be fixed to his laptop or to his car. 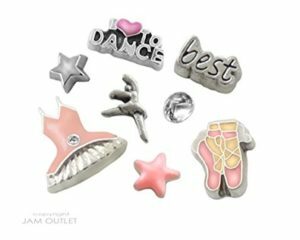 These are great gifts for dancers to bring personality and to show their interest towards dancing. This simply remarkable sticker will give a look as if the dancer images are painted on the laptop. It is easy to install as well. Dancers generally love ballerina images and this decorative mirror with the images of ballerina bears will surely impress your dancer. It is a hand painted a decorative image that can decorate any room in your home and also it has a coordinating satin ribbon providing room for placing hairclips and other supplies. 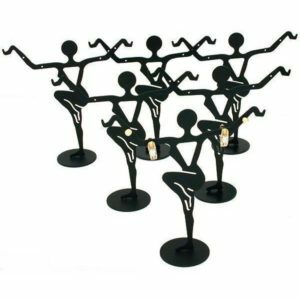 When the earring stand is also in the shape of a dancer, your friend with the motto of becoming a professional dancer will be truly impressed, right? This earring dancer stand from FindingKing can be the most useful gift for her to hand on her earrings without misplacing them because of a day of tireless practice sessions. Not just girls, but teen boys also show interest towards wearing studs these days. If your friend has great interest towards dancing and if he is also practicing any form of dance, you can present this stud earring made out of sterling silver. It can bring the momentum in for any dancer or dancer-to-be. 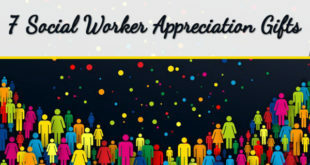 Many of us love starting our days with a hot cup of coffee and if your friend also has such an interest, you can help her/him to start the day with a dancing note. 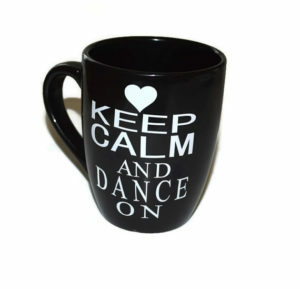 This coffee mug with the words ‘keep calm and dance on’ printed on it, will help with beginning the day afresh for your friend to engage in better practice sessions. 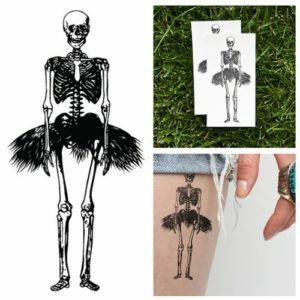 If your dancer friend has great interest towards tattooing and he/she is hesitant about real tattooing, you can present this temporary tattoo. This set has two tattoos in the shape of a dancing skeleton and they are waterproof and can last for 1-5 days from applying. As you know, life is worth recording the happenings. A ballet dancer journal can be the best place to record things to last in memory. Your dancer friend can express her thoughts, ideas, and experiences on this lined journal. If she is going to start her first dancing class, she can start recording the experienced that she get right from the first day. It will turn out to be an excellent keepsake for her for several years to come. If your friend is recently losing hope in her dancing, just because she failed in many competitions recently, you can motivate her with this capital letter B, which denotes believe. You can motivate her to believe in herself and her performances that will bring her success in the future performances without any doubt. 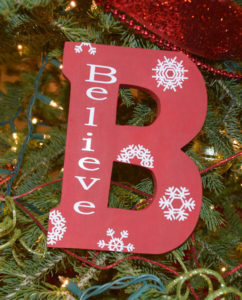 This Big B is made out of wood and can be hung on the wall to motivate her whenever she feels depressed. 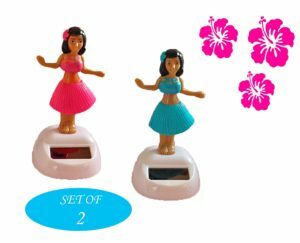 Your dancer friend will absolutely love this set of two dancing hula girls. This set is solar powered and he/she can just place the dolls near the window to see the dolls dance graciously. 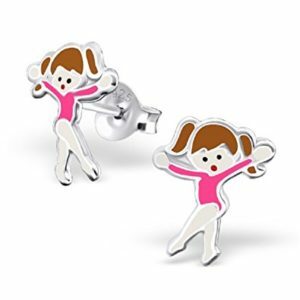 Each girl is 4” tall and this can turn out to be one among the fun gag gifts for dancers without any doubt. Like other professionals, dancers too face stressful situations in their professional life. So, fragrance essential oils can bring them relaxation after a stressful day. Only when they get restful sleep at nights, they will be in a position to be prepared for the challenges on the following day. 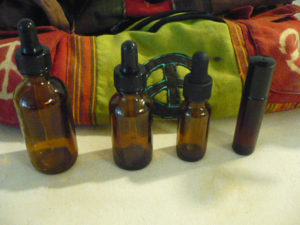 So, present the dancer with this set of essential oil, which can be used for skin moisturizing as well. Most dancers use computers these days to prepare themselves for the challenges ahead. 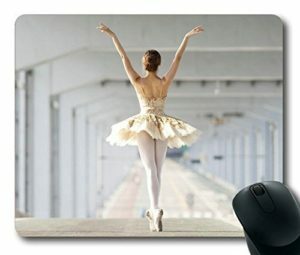 When your dancing friend places his/her mouse on this mouse pad with a dancer theme, it will give a good mood for him/her. Most girls love soft toys, irrespective of their age. This type of doll is known to provide relaxation for them. So, you can present your dancer friend with this playful dancing emoji soft doll with a smiling face. It is printed using eco-friendly process and it is made out of polyester. It is machine washable. Foot relaxation is something essential for any dancer. This OPTP Green rigid reflex ball can be the excellent tool for relaxation. This is a set of two 8cm diameter reflex balls. Also, the green color will bring relaxation to the eyes as well. A dancer will have to focus on her looks to a great extent. 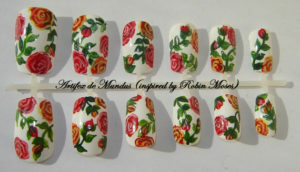 So, these fake nails with hand-printed designs can be the excellent gift that will help to pamper her. This set has 12 such fake nails inspired with ribbon moses design. Also, this set comes with an organza bag to keep them safe after use. This set also comes with 12g false nail glue. A dancer needs a lot of things to pamper himself/herself and also to keep motivated. 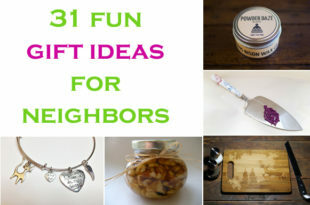 So, you can choose any of the 41 gifts listed above as you are interested in keeping your friend motivated.